Introduced in 1972 by Davidoff of Geneva, Davidoff Mini Cigarillos are manufactured with 100% pure high quality premium tobaccos cultivated from regions around the world. Machine made in Denmark, Davidoff Mini Cigarillos are infused with Java binders and fillers from Indonesia and Brazil and wrapped up perfectly inside an elegant Sumatra tobacco leaf. Offered in a variety of packages of 10 cigarillos in each tin, each styles of Davidoff Mini Cigarillos provide a sweet and smooth smoking experience for any smoker who enjoys the relaxation of a high-quality premium cigar or just needs a quick smoke on the run. 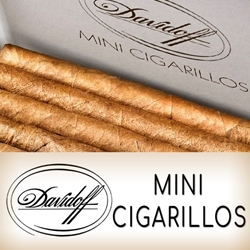 Smokers Discounts can bring Davidoff Mini Cigarillos right to your doorstep. We’ve made it affordable and easy to buy premium cigars online. A variety of sizes and flavors are listed below in our online cigar store. Each of these styles are in stock and available for a low discount price! Call us for more details!